Recently, when our team discussed Banned Books Week, I talked about Maya Angelou's I Know Why the Caged Bird Sings. When she was interviewed by Oprah years ago about the novel, Angelou said: "My belief is that you can never leave home. You take it with you everywhere you go. So my past is my present." And I feel like that quote and its truth resonates with so many of us. In so many ways, our pasts define who we are. We can let the past wreck us or redeem us, but it's ultimately our decision and ours alone. The funny thing is that it takes moving forward to realize the places you've left behind and how they've made you into who you are today. When we first meet Jessica Day in the pilot of New Girl, she has just been cheated on by her boyfriend, Spencer, after she surprises him by coming home early from a trip. After that, Jess moves out of her boyfriend's house and into the loft with Coach, Nick, and Schmidt (and then Winston, after Coach leaves to go "live with a bunch of other white people"). Jess' entire life is changed because of what happened with Spencer, and this week's episode briefly features an incredible epiphany she has while in the Nine-Nine (hello, guest stars from Brooklyn Nine-Nine!). Elsewhere in the episode, it's all about the past meeting the present, as Schmidt attends an alumni dinner with all of his former high school tormentors, and Cece tries to navigate a relationship with her new mother-in-law. Though this week's episode of New Girl had a poignant bottom line, some parts of the episode felt a bit off to me in terms of pacing and it was a little less funny than the past three weeks have been. Thankfully, the Nine-Nine characters did not seem remotely shoehorned into the episode, and were absolute delights to watch interact with our characters. Still, a B+ episode of New Girl (which I feel this was) is still better than 99% of what you'll watch on television today, so let's dive in! The Brooklyn Nine-Nine crossover takes place because "Homecoming" features our favorite West Coast characters heading back to New York for Schmidt's alumni dinner (which he soon realizes is essentially a shakedown for money, as pretty much all alumni associations are, as he was led to believe that he was there for "alumni of the year"). Once they land in New York, Winston and Nick split from the rest of the group (in a storyline that should have been a gag because the more it went on, the less funny it got... minus Nick running to "I Believe I Can Fly" and the integration of Brooklyn Nine-Nine's Boyle into their story) in order to explore the city and eat a fancy lunch. They promise to be back in Long Island in time for Schmidt's ceremony though. Meanwhile, Jess, Cece, Schmidt and Louise head back to the Schmidt residence in Long Island, where Schmidt — upon realization that the alumni dinner is basically worthless — locks himself in his old bedroom in despair. The episode features Louise and Cece at odds with one another, as both try to be there for Schmidt (with Louise critical of Cece and her actions and trying to prove that she will always know and be able to love Schmidt better than Cece). Obviously, this causes a lot of friction for Cece, but Jess encourages her to remain positive. That is the refrain that Jess sings in the episode: positivity is better. 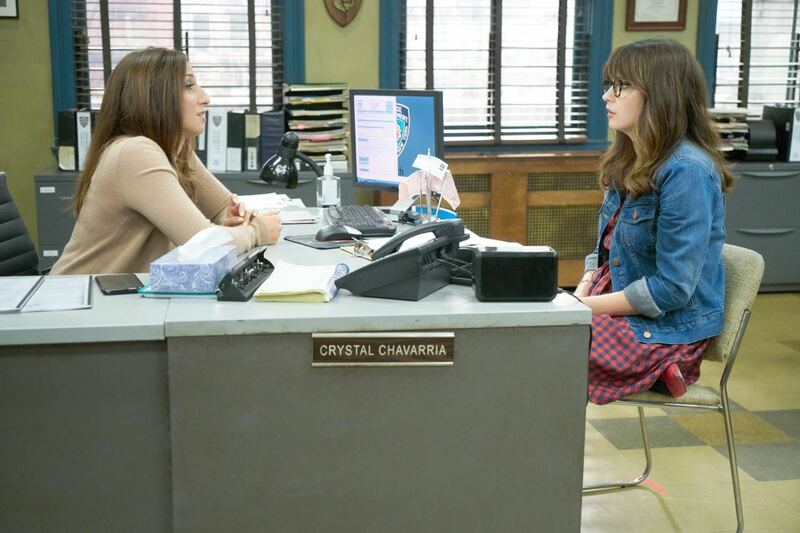 And does that really surprise us, given what we know — and have seen — to be true of Jessica Day as a character? She is an eternal optimist, until someone pushes her around. And then, her claws come out. Unfortunately for Jess, along with those claws comes bad advice. She tells Schmidt to roast his former tormentors at his alumni dinner, because ultimately Jess believes that you can't get what you want in New York without being forceful. The city hit her, so now she's hitting back. After a conversation with the Nine-Nine's Captain Holt though, Jess realizes something fundamental: your past makes you who you are, and you should embrace it. Because Schmidt was tormented, he left Long Island and his life changed for the better forever. Sometimes the bad things in life are just stepping stones to the good ones. At the end of the episode, Jess has a revelation. She spends so much of her time in "Homecoming" discussing how awful New York is, and what terrible experiences she's had there. She's fallen down manholes, gotten her friend's mom's car crashed, and more. But when talking to Captain Holt, Jess realized something: years ago, she returned early from New York because her trip was awful. And because she returned early, she caught her live-in boyfriend, Spencer, cheating on her. So maybe New York wasn't out to get her. Maybe the reason it was so terrible that one time was so that she could embark on a new chapter of her life. If she hadn't had a terrible experience, she wouldn't have cut her trip short. And she probably wouldn't have ever discovered Spencer's cheating. She would never have met Schmidt, Nick, Winston, and Coach. So many things wouldn't have happened if Jess had a wonderful experience. This kind of "everything happens for a reason" and "your past makes you who you are" moral is sweet and New Girl manages to find the sentimentality within the cliche, especially given the stage of life Jess is in right now. That's why "Homecoming" works so well as an episode — it's funny and poignant, without being overly sentimental. Jess learns a lesson, but she realizes it herself without anyone else telling her what or how to think. And the lesson is a universal one, too. You can always go home again, and sometimes even though home is exactly the same, it's you who has changed. "My eyes are all red... Ohhhhh, I see what they did." Nick and Winston's faces after Jess recounts her horrible experiences in New York were so perfect and hilarious. I'll never tire of the fact that Reggie is Schmidt's brother and also a dog. "Welcome to Long Island: the real New York." Jess' breakdown at the deli is one of my favorite things ever. When Jess snaps, it is glorious. "This city's a jungle, so you better be a freakin' lion." I love that the camerawork switches once Jake appears into Brooklyn Nine-Nine's style. It was a nice and subtle touch. "I was obviously speaking metaphorically." "Right. I was too. I love our city. It's a great place to walk around." "You think I like sitting here, handing you form after form?" "Kinda." I need more Gina/Jess interactions too. Boyle and his son interacted with Winston and Nick, and even though this story was kind of pointless (Nick and Winston spend all of their cash and try to panhandle to raise money to get to Long Island), it was fun to see those worlds collide. "In conclusion: you're ugly; I make money. You just got roasted by the California kid!" Nick trying to jump over the pile of garbage to the tune of "I Believe I Can Fly" was the greatest thing to ever happen to Nick Miller. We got a flashback to the pilot and it is amazing to see how far this show has come. "You can't be mad at your past. It makes you who you are." Everyone being terrified of Cece is exactly the kind of callback New Girl does that I love. THE END SCENE OF THE GANG RUNNING INTO COACH ON THE STREET RANDOMLY WAS SO. GOOD. What did you all think of New Girl and its crossover event? Sound off in the comments below!